LIC (Life Insurance Corporation of India) has come up with the recruitment notification for Apprentice Development Officers (ADO).This nationalized company needs no introduction as it has been serving millions of Indians for more than 50 years.The public sector insurance company operates across various zones in India & has branch offices all over the country. This is an independent recruitment by LIC & hence you DON’T require IBPS exam scores.So anyone who has not appeared for IBPS bank exams can apply for these vacancies. 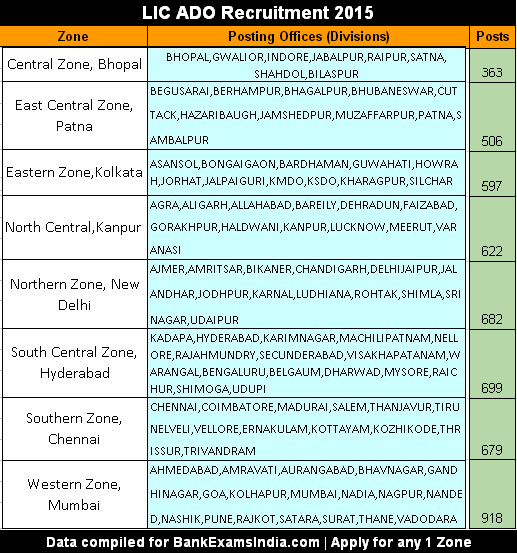 Applicants have to apply for any 1 zone & any 1 division with that specific region only. Initially ADO`s shall be paid a monthly stipend of Rs.23,836 during their apprentice period. On successful completion of apprenticeship, you would be appointed as Probationary Development Officer with total emoluments of approx. Rs.26,736/ month in addition to other benefits such as pension, gratuity, medical insurance, incentives & allowances. Though experience is not compulsory, applicants (except LIC employees & agents) with min.2 yrs exp.in insurance field will be given preference. It is necessary to pass in each paper & also secure minimum total marks (set by LIC after exam) to qualify for personal interviews. Books: Luckily to help you in preparations, books for LIC ADO exam are available on various internet stores itself. Service Bond: Selected individuals are to execute a bond at the time of joining agreeing to stay with LIC for 4 years or pay Rs.25000 incase of quitting the company. If you wish to apply for this LIC recruitment, start the registration process by visiting licindia.in/careers.htm & submit the online application. While the application fee for SC/ST is Rs.50, candidates from other categories have to pay Rs.500 only via online mode suing debit/ credit card or Internet banking. Remember to take a print of the E-receipt & the online registration form after successfully submission. Call letters for the LIC ADO online test can be downloaded starting July 13 from LIC`s website. More details: All those interested to apply can download the LIC ADO 2015 recruitment notification according to the respective zonewise advts. from their website here.